We all have those go-to outfits and pieces in our wardrobe we reach for when we’re in a hurry, or want something we just feel good in. Usually for me in the fall it’s a favorite sweater, denim and boots. Until this Indigo Tunic from J. Jill entered my life. This will definitely be a staple piece for me through the fall. Pssst! Starting today –> $50 off your order of $150 or more at Jjill.com. Use code AUTUMN50 at checkout. Valid 9/30-10/5 . 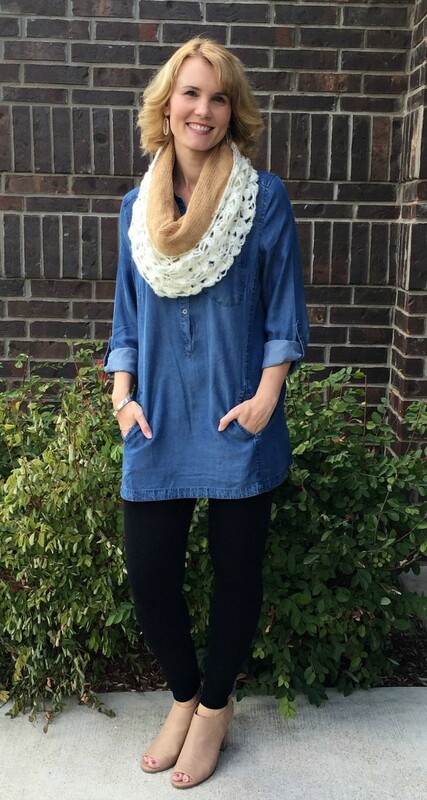 I’ve teamed up today with BonBon Rose Girls’ Moms Do Fall Fashion series. So far they’ve shared some stunning moccasin boots and a cobalt poncho that is the perfect balance between casual and dressy. To see what they styled today, head on over there AND enter their Nordstrom Gift Card Giveaway! When I find a piece that just feels right on me, I like to find a gazillion different ways to style it. I’ve worn this tunic with white denim and sandals for a fabulous summer to fall transition look, but for today – it’s all about the leggings! Yep, the leggings that made their debut on my 40th Birthday are coming out of the closet again. They are the perfect match for this tunic. To get several different looks, I changed up my footwear and scarf. All three of these outfits are comfortable enough to wear running errands, but stylish enough and so I don’t feel frumpy. 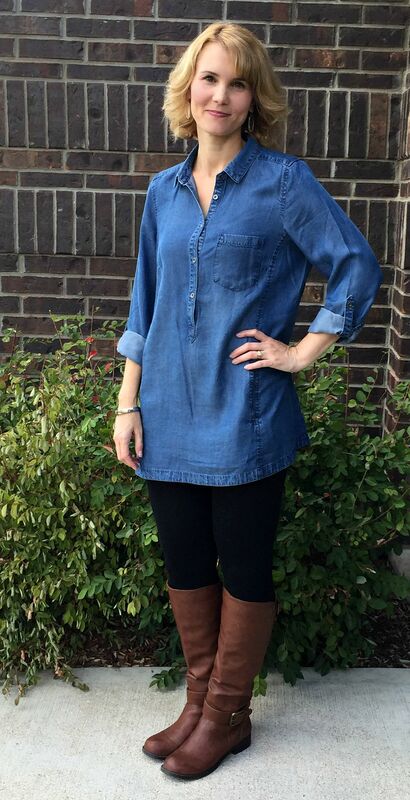 This J Jill tunic is versatile, incredibly soft (not stiff like some denim shirts tend to be), long enough to wear over leggings and the pockets are an added bonus. If you’re looking for a staple piece this fall that is well made, fits perfectly and helps you feel casual yet put together – this is the tunic for you. Don’t forget that starting today you get $50 off your order of $150 or more at Jjill.com. Use code AUTUMN50 at checkout. Valid 9/30-10/5 . See the ponchos I styled from J. Jill for fall here. Another staple piece for your wardrobe!